Travel and Tourism Industry in India is flourishing, with a total contribution to India’s GDP expected to increase from Rs 15.24 Tn ($234.03 Bn) in 2017 to Rs 32.05 Tn ($492.21 Bn) in 2028. The sector has been emerging in India not only in terms of increased international tourist arrivals in India but also because of increased interest in travel among Indians. Probably driven by millennials and Gen Zs, the culture of travel has been growing more than ever. Many players in the market are hence entering the space and trying to make the most of the opportunities the industry holds. Among the many companies, MakeMyTrip is one of the major players in the market. However, there is a lot of competition emerging in the industry. Besides the increasing competition, the Indian online travel company has to cater to the constantly changing needs and demands of the consumer and other disruptors in the market. Found in 2000, in India MMT has grown and expanded globally, with offices currently in New York, Singapore, Kuala Lumpur, Phuket, Bangkok, and Dubai. But India still remains a key market for the company. 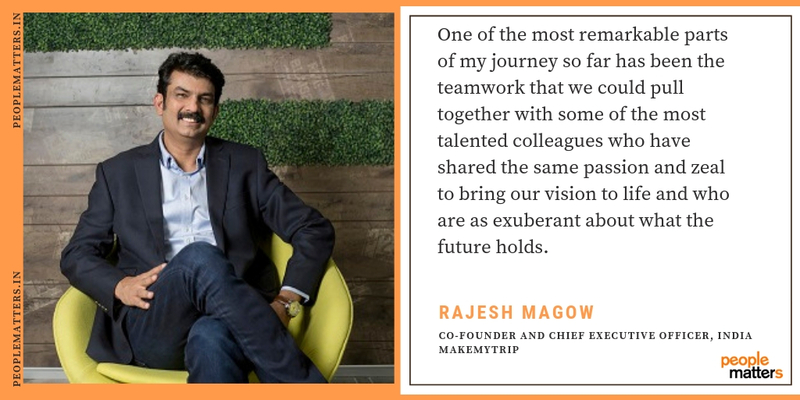 Rajesh Magow, Co-Founder and Chief Executive Officer, India at MakeMyTrip is currently leading the India business for the company and working on ensuring that MMT is India’s leading online travel company, amidst all the competition and the disruptions in the market. In an interaction with People Matters, Magow discusses the latest trends in the Travel and Tourism Industry and shares MMT's growth plan and some key areas the business will focus on in the new fiscal year. He also talks about the crucial role the talent has played and will continue to play in making MMT a leading online travel company. You have been with MMT since its inception and in these many years, you have seen the company go through various phases. How has this journey been like for the company and how has your growth aligned with that of the company’s in all these years? MakeMyTrip is among the first generation consumer-internet companies established in India and we have had a ringside view of how the industry has shaped up over the years. The idea behind starting out MakeMyTrip was to use the power of the internet to empower the Indian traveler by making travel seamless and convenient. During that time, Indians didn’t trust online payments and credit cards; they would look for what they wanted online but buy offline. The scales in the travel market tipped around 2003-04 with the launch of IRCTC and the entry of low-cost airlines in the country and there has been no looking back since. 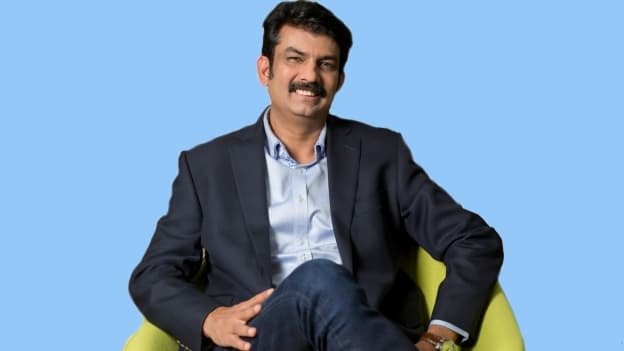 We have grown as a company in this new-age industry and it has been an enriching journey for me personally as I have had the privilege to shape and build a company that we are very proud of. One of the most remarkable parts of my journey so far has been the teamwork that we could pull together with some of the most talented colleagues who have shared the same passion and zeal to bring our vision to life and who are as exuberant about what the future holds. What are some current business priorities for MMT and what implications does it have on the talent strategy of the company? While there are many opportunity areas, what will truly set us apart is the level of personalization that we can bring in when travelers come to MakeMyTrip to plan their holiday or book hotels because the consumers today want service tailored to themselves. To be able to offer this level of personalization, we are investing in product and technology that will help us build the kind of personalization needed to make booking travel online an intuitive experience. We want to hire impeccable tech talent that wants to build solutions which make an impact at scale. We are looking for innovative ways to relentlessly improve travel experience so our talent scouting is focussed on people who are passionate about building loyalty amongst existing user base, and are excited to build products and services that will bring the next million users to the platform. Can you highlight the recent and the emerging drivers that have or may have the most impact on your business and how do you plan to face this disruption and competition? What role does talent and HR play in preparing for these challenges? We have always been a company that is competition-aware, but we stay obsessed with customers. The competition will always try to surge ahead, and in today’s time it comes from different players, but we are in a leadership position and the only way to maintain leadership is to be customer-obsessed. We believe that the Indian online travel market is big enough to accommodate more players, but over time there will only be a handful of brands as our sector has seen some significant consolidation. The travel market is thriving, and we are well poised to capitalize on the gains made so far and the strong tailwinds. MakeMyTrip’s powerful portfolio of brands today commands unrivaled market share, scale and brand recognition. We aim to provide exciting value propositions and enhanced experience to ensure that not just more people use us but more and more people keep coming back to us. While it’s still early days in conversational commerce, the market is witnessing its emergence. We are seeing very encouraging results already as we dive deeper into the Indian market beyond big cities by bringing down barriers through voice commerce and a vernacular approach. We are making a sustained investment in AI and natural language processing to understand user intent in a better way to leverage this technology and increasingly personalize service to every customer. Our chatbots (Gia for Goibibo and Myra for MakeMyTrip) have reduced the number of conversations which require human intervention by over 10%. The talent here plays a very critical role in ensuring we stay ahead of the curve - we have the right focus and are making requisite investments in talent acquisition and retention. As India’s leading online travel company, with 1 in 4 travelers being our user, we provide the opportunity to create impact at an unprecedented scale. As a culture of innovation and continuous growth is popularly identified as an essential element of staying relevant and competitive in the market, how do you as a leader ensure that your company, its solutions, and its people stay relevant and always a step ahead? Providing relevant training to employees that includes engaging content and availability in formats that enable flexible learning is the golden drawcard for keeping employees stimulated and engaged. We have regular hackathons, training and even soft skill development programmes for our employees to ensure we are equipping them with the right ammunition for their roles. Training must happen continuously for the business to remain competitive. Another very important task of the company is to prepare employees to adapt to change. Whether managerial, structural, procedural or technological, it’s well-known that humans are afraid of change. The unknown brings about feelings of uncertainty and anxiety. We make an effort to communicate frequently and transparently before, during, and after times of change. Can you share MMT's growth plan and some key areas the business will focus on in the new fiscal year? How do you plan to take MMT to its next phase of growth in India and what does it mean for the current and the potential talent? Apart from the hotels' segment which remains a key focus for us – we are tapping the opportunity in the alternate accommodations segment which is opening up in a big way in India – be it hostels, villas or vacation rentals. Our new business line focussing on providing experiences in cities is also gaining good traction and we do see that a lot more people taking to booking activities – be it while traveling or while looking at ways to spend time with friends and family over the weekend and otherwise. The focus of talent will also be on exploring these new avenues and as the company grows, the talent, both in terms of quality and quantity, grows with it.